Oh school reading how you get in the way of stuff I WANT to read. For better or worse this semester, I am reading a lot of YA for school. 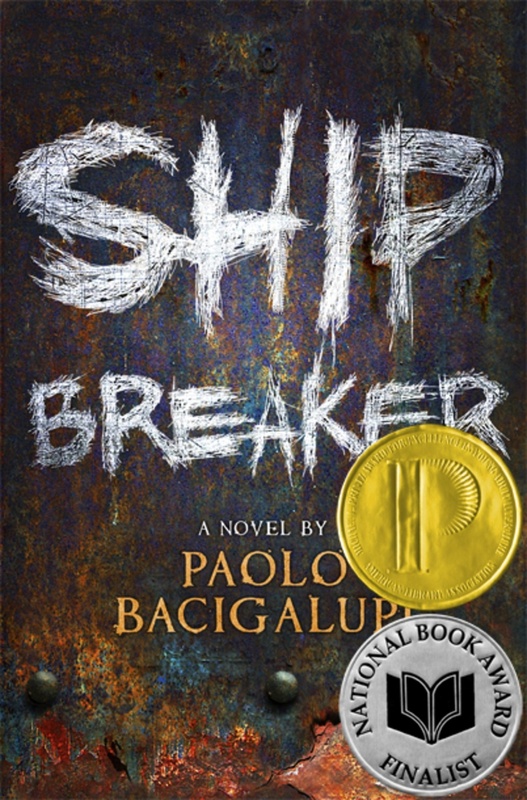 I originally read Ship Breaker in 2010. Back then and now, I feel like Bacigalupi must have suffered some childhood trauma to be able to write such a sick and twisted dystopian future wracked by an environmental disaster. This book is not for the faint of heart. Bacigalupi effortless builds this dystopian future. Very quickly I felt like I knew exactly how this incredibly different future America worked and what it looked like, and it felt horrifyingly plausible. Girls are everywhere in this book. Doing everything. Being a girl gets you no favors in this world. I love the equal opportunity crap. There are other books in this series and maybe once school is done I will finally get to book 2. This entry was posted in Post Apocalyptic, Young Adult and tagged dystopian future, Paolo Bacigalupi, post apocalyptic, post-apocalyptic future, scary, Ship Breaker, Young Adult. Bookmark the permalink.